A few months ago, I became the mother to a nine year old, it's hard to believe that nine years has gone past at what seems like an incredible speedy pace. I remember the day I gave birth to Spud and brought him into the world, I remember the day I was able to bring him home, and every milestone after. Spud always dreamed of having a house, not so much the house, but a garden, and luckily when we moved in November, he got the garden he had always dreamed of, and a massive one at that! With a difficult house move just before Christmas, Christmas, Spud's birthday, Easter and a number of misfortunes in between then and now it's safe to say that currently, I have enough to live by and that is basically all! However I have a house that is in dire need of love and attention, after being let down by so many previous tenants, and it's not just a simple case of decorating unfortunately, everywhere needs replastering and every thing down to the skirting boards need replacing! To ensure I have the suitable funds to do the house up as best as I can, I've been spending more time looking for deals by using discount codes and coupons where possible, buying tools from The Anglia Tool Centre to keep cost down, and cutting down on the once weekly takeaway! My living room - after and before! Bringing in professionals to help me with the house is just out of the question, luckily my brother Jamie is a plasterer, my big brother Dean is everything (literally! He could build a house from scratch without any outside help!) and my Dad knows how to decorate and make the walls look pretty! 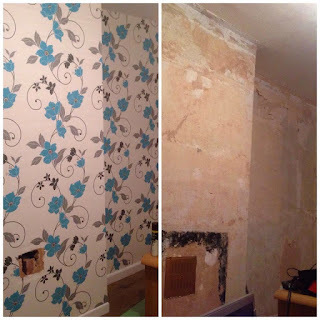 I've even had to get involved recently, I've helped strip wall paper off the walls, and rip off tiles ready for new ones to go up! I will admit that I've not even attempted to pick up a paint brush, because at the flat I desperately failed during a DIY challenge of trying to makeover my bedroom! I hope to update you on a new room very soon, so far we have the lounge and the kitchen done! There is still the bathroom and hallway, upstairs landing, my room and Spud's room to do! To talk about the garden would be a whole new subject, that is just as bad as the house! Do you have any idea's on how I can get the house done quicker and on a budget? I'd love to hear your idea's below in a comment!